Also known as the Appenzeller Sennenhund is a dog breed from the Swiss Alps region. This dog breed is medium in size and is one of the four Sennenhund Breeds that hail from this region. The name sennenhund is derived from the people of this region, because herders in the Swiss Alps are known as Senn. Appenzell is an area in the northwest part of Switzerland. 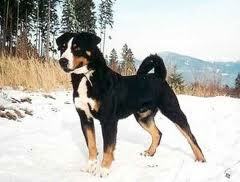 The Appenzell Mountain Dog breed is the most rare and the least known of the four types of Alpine breeds in the region. This breed was developed in Switzerland as a work dog helping with cattle moving and guarding herds, it is also used as a rescue dog and a cart puller. This is a hard working breed wanted by many but difficult to find and close to impossible to acquire because of its rarity. The Appenzell Mountain Dogs are bred to be a strong and very hardy breed, they have always surpassed their breeders expectation in being a hardy breed and are quite a healthy breed despite being inbred and despite of them being purebred. They are small and muscular in their physique, with a high endurance level so they don't fall sick often as other purebreds might. Appenzell are however susceptible to the common dog disease known as hip dysplasia.